What a Christmas miracle for power-hungry Android users. Oppo’s giant powerhouse of a smartphone, the Find 5, is set to arrive in Malaysia as part of the first batch of international availability for the Chinese company’s first foray into the international market. Among others, Malaysia is part of a big group of countries such as the usual suspects of the USA and many European countries, as well as our regional neighbours Singapore. However, the list of eighteen countries is not the final one, as Engadget was told that there would be more countries added to the list. Here’s a quick refresher to why we’re pretty excited about the Find 5: it’s the world’s second five-inch smartphone with a Full HD screen, in addition to remarkably powerful hardware such as a quad-core Snapdragon S4 Pro processor with 2GB of RAM paired with a large 2500mAh battery and 13MP camera – all in a super sleek 6.9mm chassis. 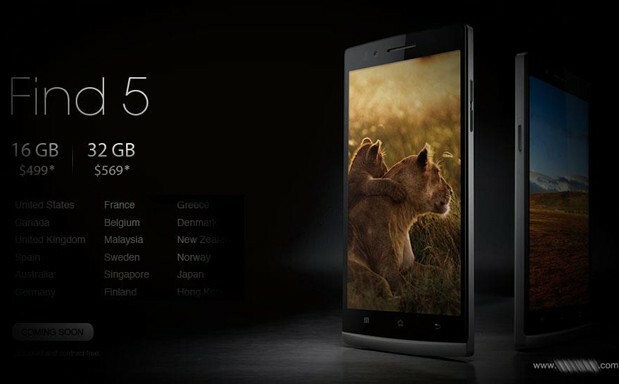 The Chinese manufacturers are also said to be aiming for availability of the Find 5 for all the stated countries within the first quarter of next year, which is definitely welcome news for us – and a pleasant surprise for our country’s Android community. You can keep track of the company’s latest news via its Facebook page here.